Hi, this is for you. Since you're not a member yet. (If you're a member already, please ignore. I am sure you also got this Wealth Strategy too.) 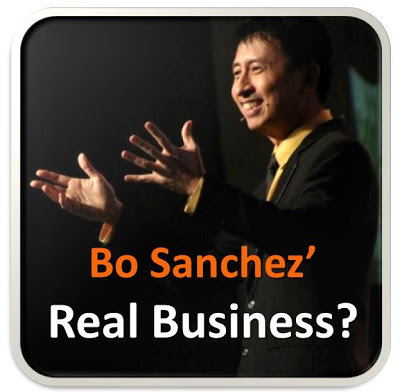 This one is part of the Truly Rich Club Wealth Strategy #176 wherein Bo Sanchez shared his real business. Yes not Writing or Speaking. Please continue reading read below. Before that. Let me share this. 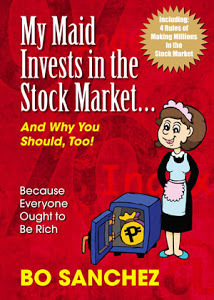 Normally, the Wealth Strategy is composed of the following: "From Bo’s Brain", Mentor's Advise, "TrulyRich Marketplace", Coming Events, MailBOX, and Bo' Last WORD. Here, I'd included the first part only, the "From Bo's Brain" acticles. I encourage you to be part of the Truly Rich Club to enjoy the whole benefits. Fifty wonderful people holed up in a hotel for four straight days. 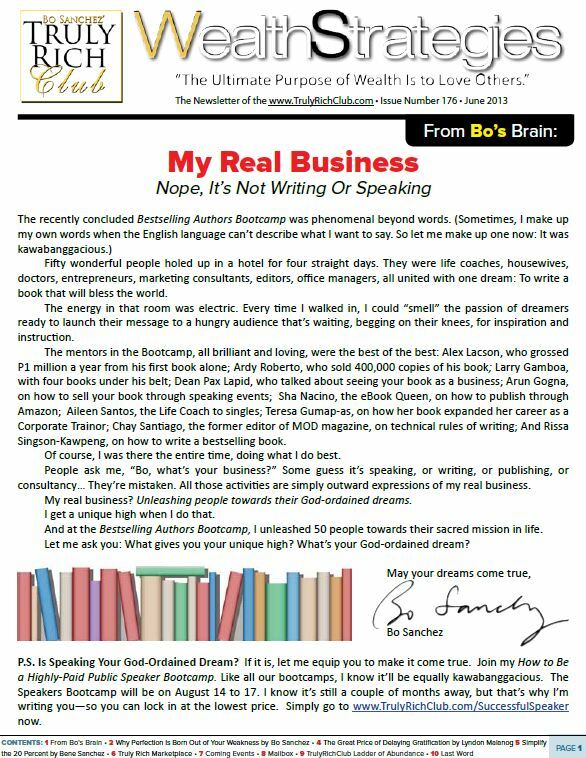 They were life coaches, housewives, doctors, entrepreneurs, marketing consultants, editors, office managers, all united with one dream: To write a book that will bless the world. The energy in that room was electric. 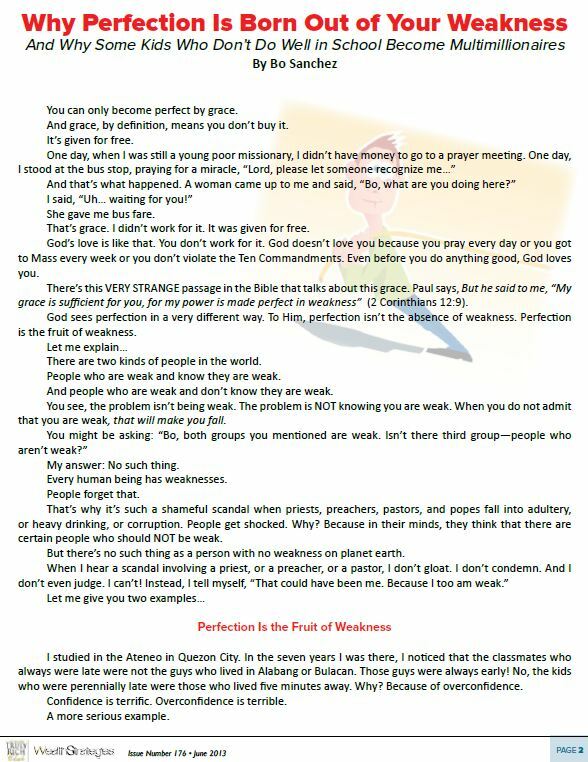 Every time I walked in, I could “smell” the passion of dreamers ready to launch their message to a hungry audience that’s waitib ng, begging on their knees, for inspiration and instruction. Corporate Trainor; Chay Santiago, the former editor of MOD magazine, on technical rules of writing; And Rissa Singson-Kawpeng, on how to write a bestselling book. Of course, I was there the entire time, doing what I do best. People ask me, “Bo, what’s your business?” Some guess it’s speaking, or writing, or publishing, or consultancy… They’re mistaken. All those activities are simply outward expressions of my real business. My real business? Unleashing people towards their God-ordained dreams. I get a unique high when I do that. And at the Bestselling Authors Bootcamp, I unleashed 50 people towards their sacred mission in life. Let me ask you: What gives you your unique high? What’s your God-ordained dream?